Had Munsell developed his color theory completely based on supposition, it would have been given a luke-warm reception by business and academia. However, back in 1907, just two years after publishing A Color Notation and more than a decade of research, academia recognized Munsell’s color theory as a major scientific breakthrough. A letter from Massachusetts Board of Education member, A. E. Winship, reveals the secret to Munsell’s revolutionary color system—the photometer, which A.H. Munsell himself developed. Winship wrote to Wadsworth Howland & Company (dealers in artists’ supplies and manufacturer of Munsell’s color education tools) on behalf of the Massachusetts Board of Education in April of 1907, that Munsell’s photometer and color globe and charts were an important scientific discovery. He referred to Munsell’s discovery as a “complete scientific development of a measured color system,” which built upon the significant milestones in color theory by scientific luminaries, Maxwell, Helmholtz and Rood. Thanks to the counsel of prominent academicians from Columbia, Harvard, MIT, and Tufts, the photometer underpinned the accuracy and validity of Munsell’s system of color. Munsell used his patented photometer to measure color and verify that his system of visually and equally spaced color hue steps was, in fact, accurate. Munsell carefully selected each color using enamel-based painted plates, which he personally created and painstakingly measured numerous times to ensure the color accuracy of each of the 10 hues. 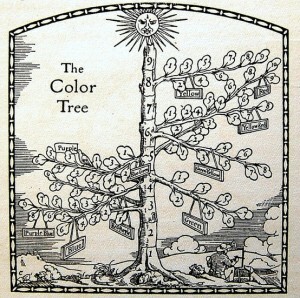 They served as a foundation upon which Munsell Color Theory was built. These “enamels” were later reproduced as part of his educational tool kit that was adopted by numerous school systems in major cities, including Boston grammar schools, throughout the country. The same attention to producing the most accurate and repeatable color standards that A.H. Munsell used a century ago, continues to be the guiding principle behind today’s Munsell Color Standards. After all, Munsell color standards are relied upon by government and industry for accuracy in matching color, grading and sorting agricultural products, and ensuring safety by guiding the color of electrical wires. Today, instead of a photometer, modern spectrophotometers ensure accurate repeatable color, lot after lot. And instead of depending on the variations of natural daylight as Munsell did, simulated, controlled daylight from light booths provides a consistent environment in which to match color accurately. Whether you’re teaching about color or visually matching color, learn how Munsell Color Standards can help you communicate color effectively.